All concerts of the Washtenaw Community Concert Band are FREE and open to the public. 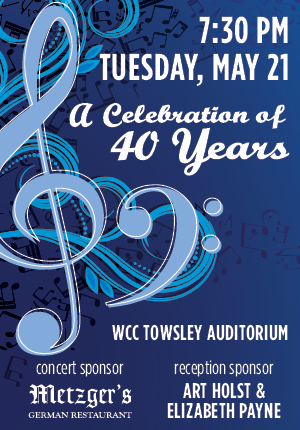 Please join us as we celebrate our 40th season! Take a step back in time to 1978 — 40 years ago — in honor of our 40th year. Dress like it's 1978, decked out from one of your favorite films from 1978 or in a traditional Halloween costume, and join the fun in a Celebration of Halloween! The WCCB celebrates the Holidays with selections both new and old from this joyous time of year. In this program dedicated to the community, the WCCB will celebrate birthdays, commemorate anniversaries, and highlight its commitment to our area. SPECIAL GUEST SOLOIST: CARSTEN WRIGHT from Pioneer High School and winner of the WCCB's Fifth Annual Concerto Competition will perform Edward Gregson's Tuba Concerto. Small ensembles play music from a wide variety of genres. Donations support the Ken Bowman Memorial Scholarship Fund. Join us for twice the music as we play a combined concert with the Whitmore Lake High School band. Join the community band as we celebrate 40 years of making music by performing selections from our first concert and premiering Star-Splitter, a new work commissioned by the band from the pen of noted composer James Curnow, who will be guest conductor at this special performance. Our annual pie social with all your favorite patriotic music to put you in the mood for Independence Day. We wrap up the season with a celebration of music from the stage.